The Kelowna Sails sculpture and fountain is lit up at twilight in City Park along the Okanagan Lake waterfront in Kelowna British Columbia. 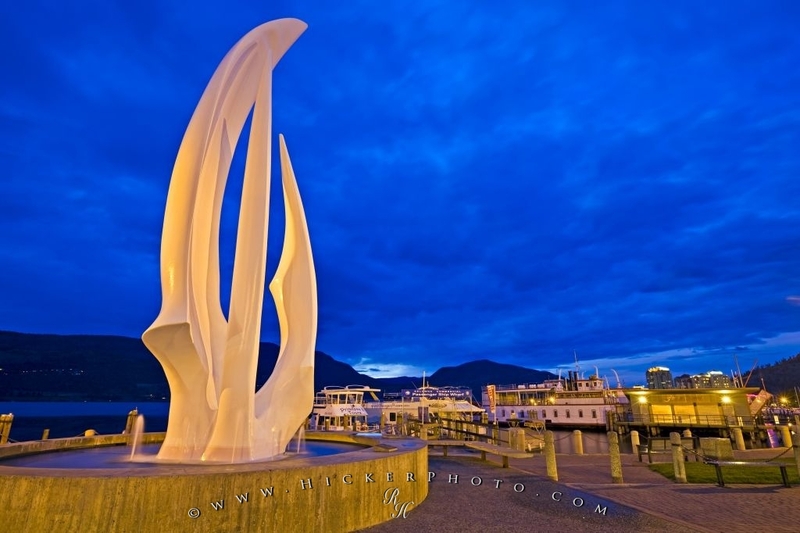 The Kelowna Sails sculpture and fountain located along the shores of Okanagan Lake, has been a common and celebrated sight in the city since it was placed there in the early 80s. It is about 40 feet tall, and was sculpted by renowned artist Bob Dow Reid. It took him two years to complete and is looked after by the City as it is such a famous landmark and symbol. The sail sculpture seems to glow as twilight takes hold of the day. Photo of the Kelowna Sails sculpture and fountain at twilight in Kelowna, Okanagan, BC, Canada. Pictures from photo gallery "Kelowna Pictures"
This picture is part of the photo album "Kelowna Pictures" - there are more beautiful images waiting for you. The waterfront area along the Okanagan Lake shores is part of a redevelopment project that will see some of the features change or improve, but the Sails sculpture is one landmark that will stay the same no matter what. The water feature around it may be redesigned, but the sculpture will not be. There mgiht be more of an opportunity to walk and sit around the sculpture as this is such a beautiful and popular location, both tourists and residents like to enjoy the view from this waterfront. Kelowna Sails sculpture and fountain in City Park along the Okanagan Lake waterfront at dusk in the city of Kelowna, Okanagan, British Columbia, Canada. I photographed this photo with the digital SLR camera model Canon EOS-1Ds Mark III, aperture of f/8.0, exposure time of 8/1 sec. on ISO 100, as always I used a original Canon Lens, the focus lenght for this picture was 18mm.